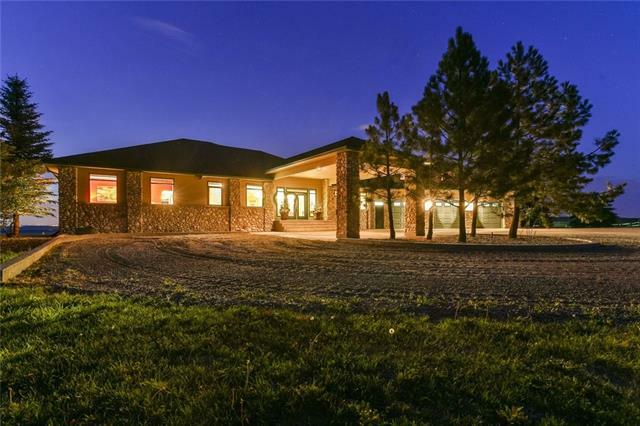 "Absolutely stunning pastoral & city views from this 320 acres - Yes an entire 1/2 section! This lovely walk out home sits back from the main road & you may see Elk or Deer as you pass the pond on your drive up to the house.A great location to live in the country & be city close.There is a 6 stall barn,horse paddocks, fields & beautiful vast landscapes as far as the eye can see.The massive heated shop is 3400 sq ft with locked safe area,220 V & tall vaulted ceilings.A portion of the fields are used for grazing & some hay.The home has recently been upgraded with all new Hunter Douglas Blinds,Refinished hardwood & some newer appliances.The open living area takes advantage of the views,wrap around deck off the eating area and the large country kitchen. The Master Bedroom features a wall of windows, gas fireplace & spectacular ensuite with jaccuzi tub, his & her sinks, large wardrobe area with laundry hook ups. A walk out basement, wine room,gun safe & recreation room .Come & look and you won't want to leave!"